New arrival micro ring hair extensions. There are #1b natural black and #613 colors options available. Each package has 4 pcs, while each piece contatins 25 strands of hair, so there are 100 hair strands in one package. Each hair strand weighs about 1 gram, so the total weight is around 100g. The size has 14, 16 and 18 inches for you. These hair extensions can be used with all types of European or Brazilian hair extensions. 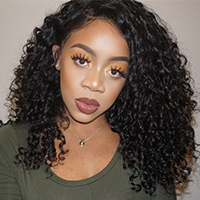 It is the most undetectable hair extension technique, the latest glue free method to have each individual section of hair connected to a micro ring and very quick as well as easy to use. Good hair Review by Kia A. Hand down the most amazing company to work with. Shipping is really fast and took less than 4 days.